Primefaces provides built-in Ajax support. It provides various attributes like update, event, listener etc. Here, we are creating an example that explains ajax attributes. The following table contains Ajax attributes. listener null MethodExpr It is used to process in partial request. Immediate false boolean It returns a boolean value that determines the phaseId, when true actions are processed at apply_request_values, when false at invoke_application phase. process null String It is used to process in partial request. update null String It is used to update with ajax. onstart null String It is used to execute before ajax request is begins. oncomplete null String It is used to execute when ajax request is completed. onsuccess null String It is used to execute when ajax request succeeds. delay null String It is used to set time to delay. If less than delay milliseconds elapses between calls to request() only the most recent one is sent and all other requests are discarded. If this option is not specified, or if the value of delay is the literal string 'none' without the quotes, no delay is used. partialSubmit false boolean Enables serialization of values belonging to the partially processed components only. partialSubmitFilter null String Selector to use when partial submit is on, default is ":input" to select all descendant inputs of a partially processed components. event null String Client side event to trigger ajax request. 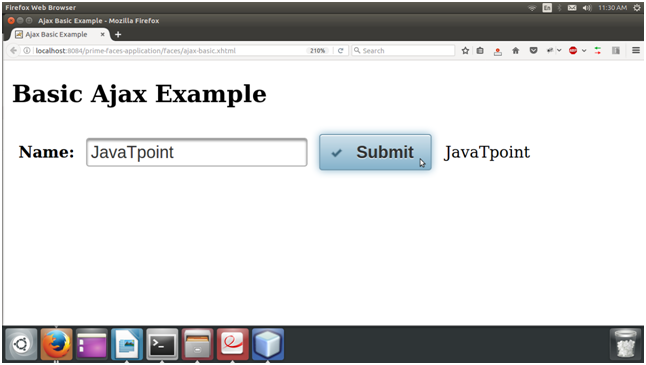 This example explains a built-in Ajax usage in the application. It updates the back-end value and displays output by using Ajax. This example includes a JSF page and a ManagedBean. After entering value and pressing submit, it produce the following output.